Last Wednesday evening, staff, parents and governors met together at a public meeting in the 'Green Man' on Bromley Road, SE6, to start an urgent campaign to Stop Academies In Lewisham. However, these are probably not the only schools where plans are being discussed. If these convert, others may well follow, including primary schools too. After all, Knight’s Academy took over Merlin primary, and Aske’s Hatcham took over Monson. On top of this, plans for two ‘free schools’ have also been announced in the local press. Thanks to contributions from Alasdair Smith from the Anti-Academies Alliance and Robb Johnson from the successful 'Hove Park not Gove Park' campaign, everyone left the meeting determined that we weren't going to allow education in Lewisham to be ripped apart. Our first Action Committee will be held this Monday with plans to build the campaign across the borough and, in particular, plans for co-ordinated union strike action to oppose these threats. There is no real evidence that academies do any better for children than community schools. They certainly don’t do better for all pupils. The National Audit Office reported that “the gap in attainment between more disadvantaged pupils and others has grown wider in academies”. Just like any other school, some academies succeed, but many others have struggled. They are no ‘magic solution’ to improving education. Of course, the easiest ‘solution’ to improving results is to change the pupils and families you attract to your school. Research suggests that’s exactly what some Academies have done. But that just means ‘improving’ at the expense of other schools. That just makes things worse. Schools can improve when they have support, funding and can share ideas. But, by breaking-up Local Authorities, Academies prevent this. If Lewisham education is dominated by lots of competing academies, there will be even less co-operation between schools. There may be some ‘winners’ but there will definitely be some ‘losers’ too - and they will be Lewisham children. There will be even less support on offer from the Local Authority - because its education services will effectively cease to exist. It will be even harder to plan for the school places we need. Instead of allowing academies to divide local education, we must campaign together for the support that schools, children and staff need. Don’t believe arguments that say converting to an Academy brings lots more resources. Yes, the school gets more income - but it also has more costs too, spending on services that used to be organised by the Local Authority. This may cost them even more than before. Academy conversion actually brings greater funding risks as schools lose the security and economies of scale of being part of a bigger Local Authority. Schools will no longer be able to rely on the financial help that Council can provide to manage a sudden crisis. To find security, many academies end up as part of a bigger commercial ‘chain’ like Harris. Elected Councils are replaced by big businesses. Every month, a new academy scandal exposes that there may be even fewer resources for staff and pupils - it might be being spent elsewhere! Just this November, the National Audit Office reported that nearly half of the academy trusts they examined had paid public money towards private businesses of directors, trustees and relatives, worth an estimated £71 million. Some appeared to involve “improper” practices. The Executive Head at Durand Academy is being paid over £200,000 - a 56% pay rise last year! Should anyone be surprised? If academies are given ‘freedom’ to run their own affairs, then these kinds of scandals are inevitable. Academy schools should be returned to Local Authorities. Converting to an academy threatens staff and unions. It will cause upset and staff turnover. Some Academies have worsened conditions, e.g. even greater workload or worse sick pay. While academy Heads are often paid more, DfE figures show class teachers are paid less than their colleagues in maintained secondaries. Fragmenting schools into different academies will create a fragmentation over policies too - including on crucial issues like performance-pay. Dividing schools like this makes it harder for unions to defend its members. 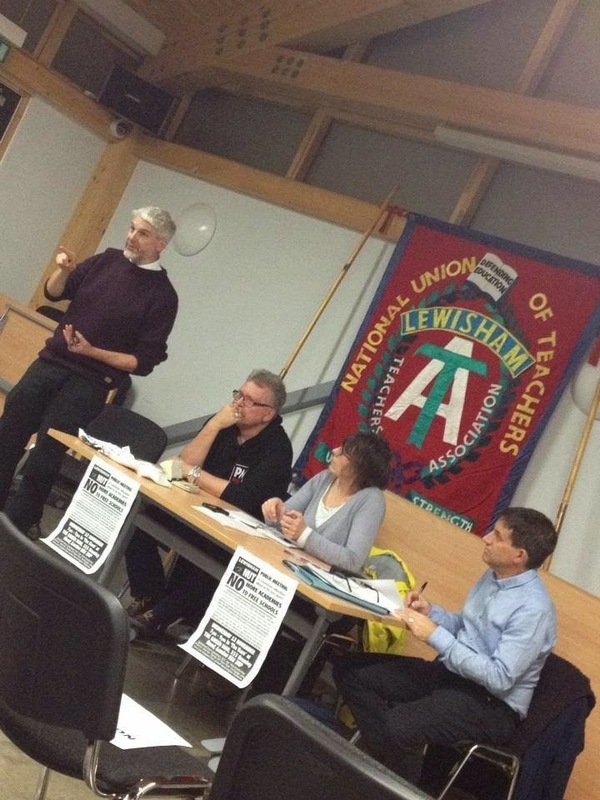 In fact, it could mean teachers lose access to a Lewisham union representative altogether if facility time is cut. Academies are part of a wider agenda to get rid of Local Authority-run services altogether. Funding cuts mean Lewisham Council is already cutting many of its services. Turning schools into academies leaves even fewer Council services. If you don’t think your Council is doing a good job, you can lobby your Mayor and Councillors - and elect new ones too. But academies and free schools are not accountable to the community. If we don’t fight for our schools and services, what will be left? Schools will be in the hands of unaccountable businesses and individuals. Some hope to make profits out of education. Let’s campaign for education, not privatisation. Government legislation allows schools to become academies very quickly. We need to act fast. In order to rush through their plans to turn schools into academies, this Government introduced an Academies Act in 2010. It allows schools to become academies in a matter of months. All it really takes is a majority vote at a Governing Body meeting. Schools are meant to ‘consult’ about their plans but few consult properly. Such an important decision should really only be taken - if at all - after staff and parents have been balloted - with information, against as well as for, fully circulated first. Discussions are already taking place in secret. First, let’s demand an open discussion where staff and parents are fully briefed on plans. If an academy is planned, then we have to act to stop it.